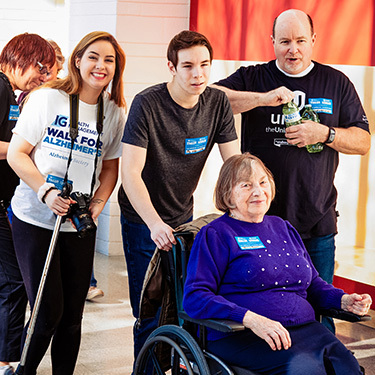 Behind every person with Alzheimer's disease or other dementia are hundreds of Alzheimer Society staff supporting people at every stage of their journey. Alzheimer Societies across Canada provide programs and support services to help people with all forms of dementia, including Alzheimer’s disease, in addition to assisting their caregivers and families to live as well as possible. The Alzheimer Society is a leading Canadian funder of dementia research. Since 1989, we have invested over $53 million in biomedical and quality of life research through the Alzheimer Society Research Program. Our mission is also to raise public awareness about Alzheimer's disease and other dementias. We are a key partner in the development of Canada’s first national dementia strategy, which will enhance research efforts and ensure access to quality care and support for all Canadians affected by dementia.